Photos of the Mojave Desert, including the National Preserve. The Mojave Desert occupies over 22,000 square miles of land between the Great Basin Desert to the north and the Sonoran Desert to the south. Extending from the Sierra Nevada Range to the Colorado Plateau, it occupies a significant portion of Southern California and parts of Arizona, Nevada, and Utah. It is considered high desert because the average elevations range from 3,000 to 6,000 feet, although the extremes are in Death Valley with Telescope Peak at 11,049 feet and Badwater at 282 feet below sea level. Temperatures range from 120F+ in the summer to 0F+ in the winter depending on the elevation. High winds, often above 50 miles an hour, are a major factor along the western Mojave. The Mojave Desert is home to approximately 200 endemic plant species, including the unusual Joshua Tree (Yucca brevifolia). A majority of the fauna also extends into the Sonoran or Great Basin deserts, however there are a few that are distinctly characteristic of the Mojave, including the Mojave rattlesnake (Crotalus scutulatus), the desert rosy boa (Lichanura trivirigata), the chuckwalla (Sauromalus obesus), the desert iguana (Dipsosaurus dorsalis), and the regal horned lizard (Phrynosoma solaris) which squirts bloody fluid from its eyes when threatened. The Mojave is also home to the federally-protected desert tortoise (Gopherus agassizii). Roughly half of the Mojave desert habitat remains untouched, and the remaining half has not been drastically altered by human activity. It is a harsh environment that shows dramatic evidence of a violent volcanic past. It is also filled with incredible beauty, wonders like the singing Kelso Sand Dunes, and a wealth of Old West history such as petroglyphs, old mine shafts, abandoned cabins and historic army outposts. Although Death Valley lies within the Mojave Desert, those images can be found in their own gallery. 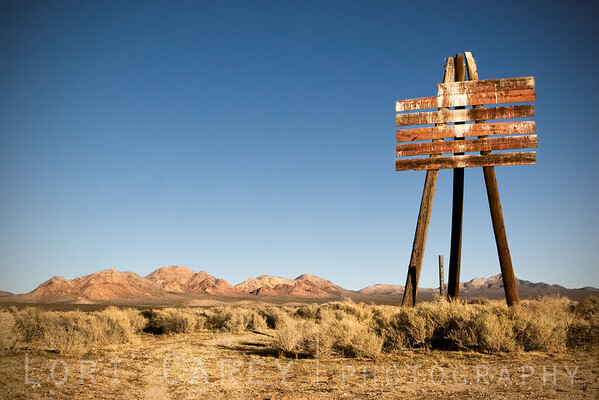 Appears to be an old blank signpost standing tall on three legs near the old gunnery range at Cuddeback Lake in the Mojave Desert, California.